Tim and I have been meaning to add another car to our family for almost a year. With both of us working and having kids, carpooling and accommodating growing car seats has posed its challenges over the last 10 months. When you're facing upwards of 50K in student debt (and climbing down the hill from 100K), buying any sort of big purchase immediately becomes more complicated. We need to remain smart and prudent while accommodating our changing circumstances and growing family. Striking that balance isn't easy. They say buying a brand new car is the worst purchase you can make as it begins to depreciate when you drive it off the lot, so we were unsure of committing to a high payment every month for something that will just lose value. Though finding the perfect used car on Craiglist is time-consuming—time we didn't have. So, in a bit of we-got-to-get-this-done mindset (the worst mindset to have when shelling out a wad of money) we decided on the car we wanted, found a rental place that had one, and got pre-approved for a loan. A few days before we went to seal the deal, we were talking to a family friend who is experienced in this area. He suggested what to look for on Craigslist, and I did some searching that weekend. We found a few contenders and decided on an '09 Dodge Journey with over 100K miles on it. The avid new car buyers might think we're crazy, but we did our due diligence in researching—clean title, well-maintained, all highway miles, new brakes. 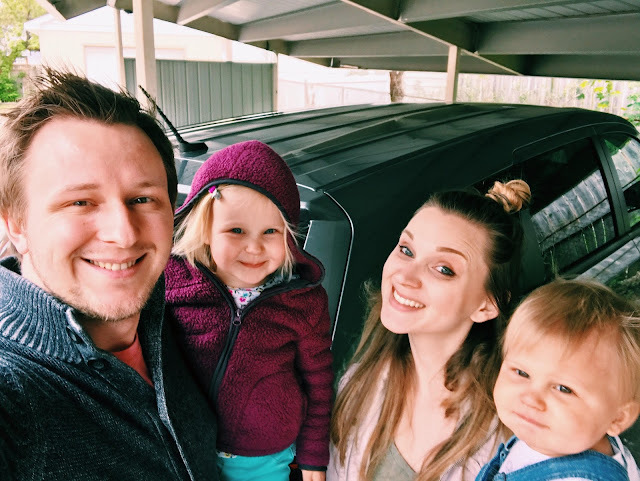 We were able to negotiate the price down, write a check, and drive away—no loans, no car payments and we now have the car that will serve our needs for the time being. We decided to put any sort of car dreams aside (buy for now, 2016 Pathfinder) and focus on a down payment for a house. For us in this stage of our lives, buying a house is our top priority—right underneath paying off our student loans, that is. With both Tim and I working, having a car payment every month wouldn't have killed us. It's for this very reason that we momentarily lost sight on our big picture goal and thought shelling out a handful of hundreds on a car payment was the right call. Just because it was doable doesn't mean it would have been the best use of our money, and it wouldn't have been. I'm happy to have had that conversation which brought us back down to earth. When your journey of paying down debt is years-long, it can be easy to stray the path. Double incomes!? Let's buy the entire Target clearance rack! It's almost easier to have less money. So, on our path we continue. Man, it's a damn long trail. But we've celebrated so many little victories and buying car out of pocket was a pretty big one for us. So, let the 'Journey' continue.